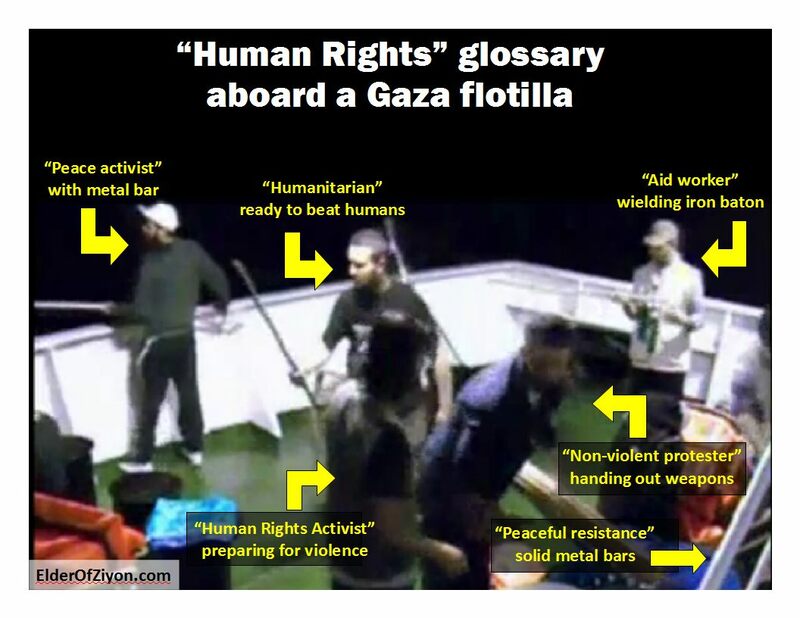 A quick, quality video from the IDF Spox...putting it all into perspective, explaining why the flotillas have nothing to do with providing humanitarin aid to Gaza. What are the primary issues surrounding Israel these days? 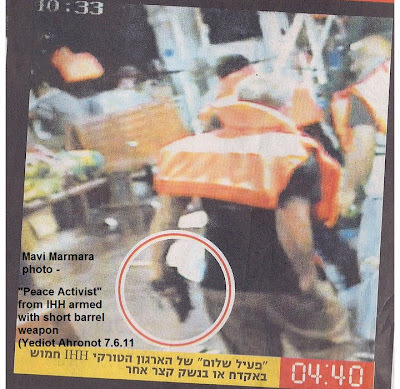 Suspected IDF sabotage of Flotilla ships? Successful Counter-Boycott of Scotch Whisky in WDC. Arrest of R' Dov Lior for writing a letter of approval for the book, "Torat HaMelech"
ALIYAH -- Is it so much better in the USA? So much to blog...so little time...pick a topic and I'll blog it today. One of the aftermaths of the Holocaust was that overt Antisemitism became officially frowned upon in many countries, and over time even became socially unacceptable in an overt manner in many circles. But as memory of the Holocaust fades, Antisemitism, merely suppressed and not eradicated, has come back out of the closet in full force. Today, Antisemitism still wears a façade in order to make it socially acceptable, but I hardly expect that façade to be required for much longer. The most common veneer we see used today is simply saying ‘Israel’ and ‘Zionist’ instead of ‘Jew’. But there is also the type that hides behind the activities of many “rights” groups, such as human rights, animal rights, Palestinian rights, etc, recent examples include the BDS movement, and trying to ban circumcision and kosher slaughter (Shechitah). Under the guise of ‘animal rights’, Holland just signaled their intent to ban kosher slaughter in their country (the JC article isn't 100% correct, see the end of the post). How much longer before they ban the import of kosher meat too? Of course, Holland being an enlightened country will not outright ban kosher slaughter, instead they will ban any method of slaughter that does not first stun the animal, which as a known side-effect renders it unkosher. They allegedly did this out of concern for animal rights and suffering. 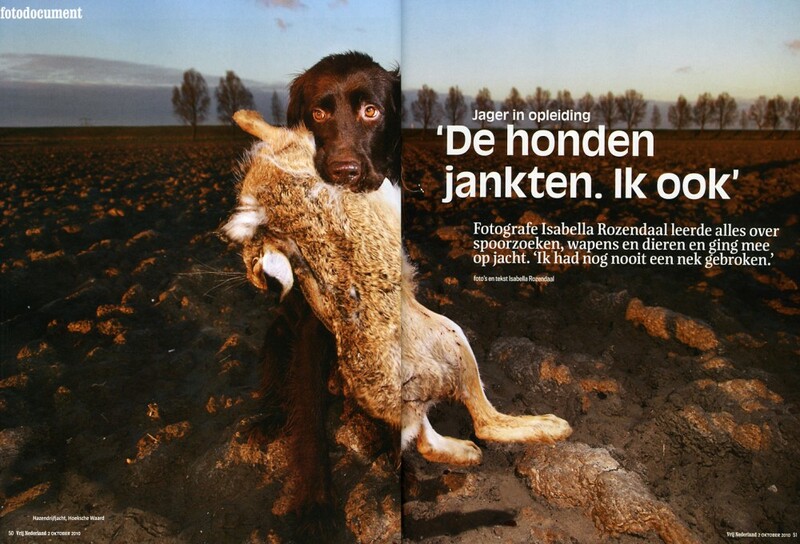 There are those that posit that this was done as a backlash against the growing Moslem community and that specifically Geert Wilder's PVV party was using this to attack the Moslems, using the tacit support of animal rights groups in Holland to get it passed. It is clear enough that Geert Wilders is NOT Antisemitic (though he seems to me to be anti-Islam (but not anti-Moslem)), but I don't think he had good enough advisers that understood the difference (or cared) enough to differentiate between the slaughter methods. Only this plan backfired (if it were true, because it is also clear that Wilders found himself stuck in a political mess created by these animal rights groups.). Just as Hallal meat has no problem with short and non-straight knifes, which can be painful and ineffective (and cause other problems) in their slaughter method, it potentially can work with certain pre-stunning methods, though not all. So only Jewish Shechitah will be banned as a result, Not Moslem slaughter (Dhabihah). If they really wanted to target Hallal slaughter methods, the government would have legislated knife requirements and cutting methods. Jewish slaughter methods and requirements are 100% acceptable to Moslems, and this would have removed any possible inhumane aspects from Hallal slaughter. Out of curiosity I decided to see how concerned the Dutch government really is when it comes to animal suffering and animal rights. There are other activities that typically cause much far more pain and suffering to animals. And many people see it as simply cruel behavior. If that activity were banned in the Netherlands, then at least they could make a case that this was about animal rights and not an agenda driven by hidden Antisemitism. But as it turns out, the Dutch government doesn’t really care much about animal suffering at all. You see, hunting in Holland is legal, and it certainly does not require that you stun your prey before you shoot at it from 50 yards hoping to hit the poor animal. 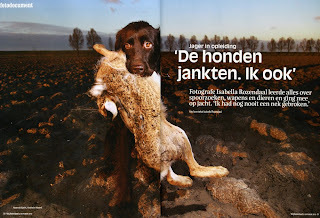 So while there are approximately 45,000 Jews still living in the Netherlands, many of whom rely on the humane method of Kosher slaughter which may soon be illegal, we can compare that to some 30,000 Dutch citizens who have licenses to hunt and try to kill animals from a distance, for sport, without stunning them first and certainly with no minimal guarantees the animals won’t suffer from this. That’s not hypocrisy. That’s overt Antisemitism. Just to point out the obvious, the Holocaust began just a few short years after the Nazi party (and friends) began banning Kosher slaughter (Shechitah). Meanwhile, the only light here is that certain items in the bill are not yet 100% clear - nor has the exact wording been publicized. The bill that passed today had one definite change. All slaughter will now require licensing and the applicant organization has the responsibility to prove that its method of slaughtering is humane. This still leaves a window open for Kosher slaughter, which is done with the highest of standards. Furthermore, this law still has to pass through another House where the animal rights nuts are less influential, and where (ironically) the Moslems have more influence on the main parties. The only thing clear about all this is that there is a lot of Antisemitism driving these various activists groups and they are becoming more blatant about it every day. Labels: holland. netherlands. dutch. ban. kosher slaughter. shechitah. shehitah. hallal. dhabihah. Israel's unemployment rate has reached an all-time low, standing at only 5.8% in April – a total of 186,000 unemployed people, despite the rise in the number of workers joining the labor market. Nefesh bNefesh is standing by to help! For all those who thought the Whisky Counter-Boycott was a bad idea -- the Scottish Government has firmly issued a statement which strongly disavowed the West Dunbartonshire Council's boycott of Israel. A little more pressure and the West Dunbartonshire Council will crumble and rescind their boycott of Israel! Thanks to all those across the globe for making this happen! Many Jewish Scotch drinkers were drunk with anger -- almost to the point of vomiting -- when a small village in Scotland enacted a ban on Israeli-made goods last year. The town, West Dunbartonshire, is home to many distilleries that produce a brand of booze considered sacred by many alcohol-guzzling Jews: Scotch whisky. Sen. Mark Kirk (R-Ill.), not a Jew, was one of the few in Congress to take this issue seriously (which is a good thing). Kirk quickly realized that while the Scots may be perpetually sloshed, those in the West Durbantonshire Council were demonizing Israel in a serious way. "The Scottish Government and the Scottish National Party have a responsibility to speak out against attempts to delegitimize and castigate a fellow democracy and strong Scottish ally like Israel," Senator Kirk said in a statement. Kirk demanded that the Scottish Government take a stand: Are they on board with the local council's anti-Israel boycott? When a powerful lawmaker like Kirk demands answers, he soon gets them: The Scottish Government and the Scottish National Party today strongly disavowed the West Dunbartonshire Council's boycott of Israel (via the British embassy). Score ONE against the BDS movement! In a rare, spontaneous sort of way, I left work for an hour to attend Israel's "President's Conference" and hear President Shimon Peres address a group of bloggers. A: Return to understanding what Judaism is: readopt the 10 commandments...and help Israel survive; militarily, economically, and spiritually. Some basic questions were asked...whats the best way to market Israel, what would you tell advocates for Israel on US campuses...now someone from La Figaro (France) is asking a question. A 15 year old blogger asked a question, though I'm not sure who he is (thought he might be Daniel Pereg) but I don't think its him. He asked whats the best way to market Israel, and Peres replied to be a moral person. It's fun seeing all these bloggers I haven't had the chance to see in a while; David from Jewlicious, Aussie Dave, The Big Felafel blog, Esther from myurbankvetch, Sarah from the WorldWell (and Jewlicious), Carl from Israel Matzav and others (will fill in the hyperlinks later). Peres says we have 60% of the support of the American people. Q: Since you like science, do you also science fiction? Is there anything from science fiction you h that helps you look forward? A: Computers are moving everything forward at a tremendous rate. Yet we don't understand the human brain. I think the coming 10 years will be devoted to the mind. Since there won't be a world government, there can be self government (People will know what makes them happy, angry or sad, and this will help themselves). Is education a service or an investment? To educate is to produce. The same goes for health. If you don;t have healthy people, you can't produce. 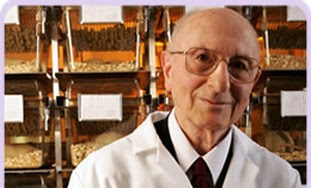 People need to not only extend their life expectancy, but to make their lives more meaningful. People should invest in science and labs, not the stock market. Shoshana from The Third Sector: Currently non profits are very poor, and the answer isn't getting money anymore from the US. I believe the third sector should be supported by the government and businesses. What do you think? I think people need 2 passports; national and global. Our national passport should be spiritual and cultural...whats going on at home. Borders are not important; identities are. I don't understand how he answered the question...whatever. Question from IBA reporter: Many believe the Cottage Cheese Boycott is indicative of the prohibitive cost of living in Israel? Answer: We need to change our agenda. Education is more important than money. The earning of a person with an academic degree is 30% more income . I want to see every girl and boy have free academic education. I want to see army service to include a university education, and that every outgoing soldier will have a BA degree. Education is entry to a better world and a better income. We need to change our concepts. Producing is by education and better health. As there is a physical gym, there is an intellectual gum to exercise your mind as you can your body. If you eat 3 times a day, you'll get fat. If you read 3 times a day, you'll be wise. Better to be wiser than fatter. We used to be a land of milk and honey, now we are a land of cottage cheese and chips. We have the highest rate of milk production per cow in the world. Even raising salaries, but food costs more, you haven't achieved anything. We need to change the cost of the way from the cow to the consumer. Why are we paying more? We need to check it profoundly and carefully. The victims are the middle class and the large families. No matter how rich you are; rich and poor pay the same for an egg and glass of milk. For the rich its nothing. For everyone else, its very serious. By increasing the price of commodities you are hurting people, making income raises meaningless. We need to correct this as soon as possible. The entire team of the Jewlicious blog are asking questions from Jimmy about Wikipedia. Wales: We need better tools for ranking WikiPedia pages to see if people like the sources and wikipedia article entries. The mission for wikipedia is for their to be a free encyclopedia for everyone person on the planet, in their own language. Q: The Western Wall has 2 complete different entries with different information between them on the Arabic and English Wikipedia entries. Its a human process. Quality comes first. How do each of us see outside our own frameworks. Jameel's thoughts (in my head): Facts are irrelevant when "narratives" are introduced...the Arabic articles in Wikipedia are lies, denying the existence of the Jewish Temples. Yet, these are considered the Arab "narrative" (their own make believe version of history). A mosque built (illegally?) on the Mount of Olives is currently being illegally expanded, to just a few meters away from the grave of Prime Minister Menachem Begin. Work done by the Jerusalem Municipality to pave the path near the grave was ripped up and nearby trees were uprooted. Everyone in charge is aware that the illegal construction is going on, but no one is doing anything about it - because of the "sensitive nature" of stopping it (presumably the Arabs will riot). So instead they pass the buck. Jonathan Pollard's father, Morris Pollard YZ"B, passed away at 95 on Saturday. Jonathan was not allowed to visit his father on his deathbed, despite pleas to Obama from many sources (including those in the US government). Will Jonathan be allowed to go to the funeral? He was not allowed to go to the funeral of his mother. Friday June 17: Security video from inside the cafe as the gas leak exploded. 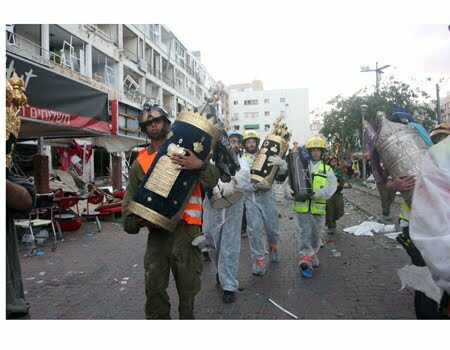 Firemen taking out Sifrei Torah from the shul that was in the building. We are updating this post as details come in. There is a lot of confusion and unknowns still at this point. 34 dead, 15 36 wounded in explosion in "Cafe London"(?) (or Yotvata) apartment in Netanya in Kikar Atzmaut. 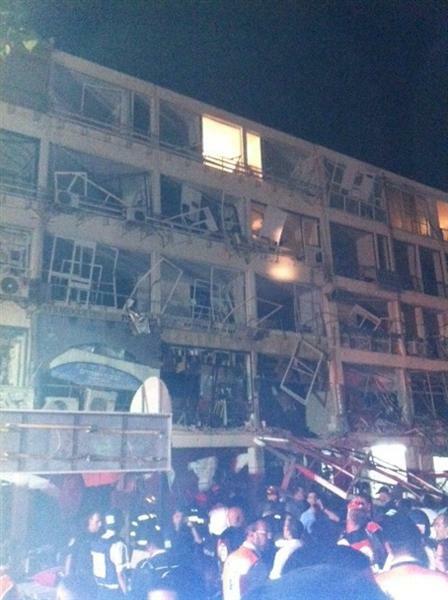 Explosion occurred just after midnight. The cause of this explosion is NOT known at this point. It may be "mob" related hit. It may have been a gas balloon that blew up. 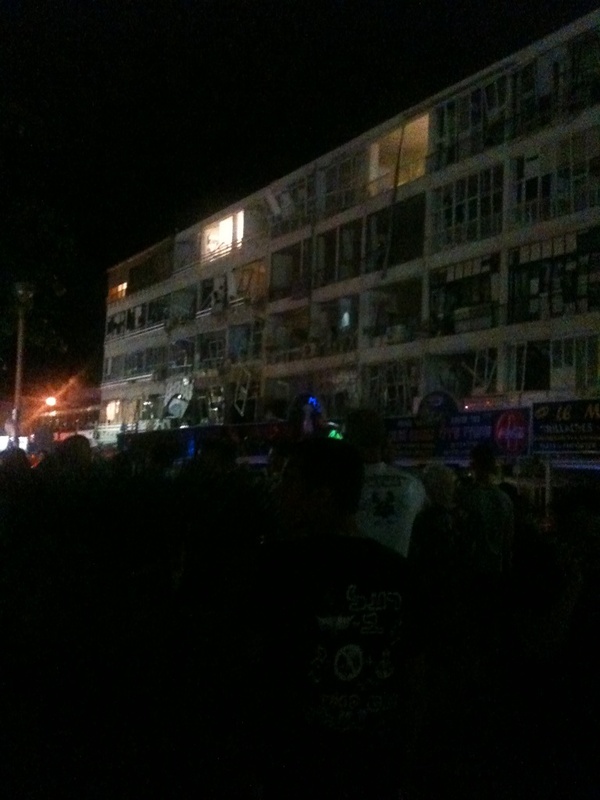 Police now suspect a gas leak in a 3rd floor apartment caused the explosion. Police have arrested at least one suspect they believe may have cut a gas line. The 4 story building is in danger of collapse from the explosion. In other news, a Grad missile was launched Thursday night from Gaza. No injuries as it landed in an open field. Labels: Netanya. Cafe London. Explosion. Gaza. Grad. Finally! After more than a week of ignoring the global Whisky counter boycott, the newspapers in West Dunbartonshire are informing their residents of the news. "ANGRY Israeli nationals have launched a counter-boycott against Scotch Whisky companies, including Dumbarton's Chivas Brothers. The Dumbarton Reporter thinks the counter boycott is limited to Israel? Haven't they been following the news? This is a HUGE, GLOBAL boycott...with tens of thousands of participants! But a spokesman for WDC hit back at the latest move saying: "The boycott on the purchase of Israeli goods was a decision taken unanimously by West Dunbartonshire councillors in January 2009 in an attempt to highlight the Israeli state's unacceptable use of force in the Occupied Territories. The recent coverage of this decision has been utterly sensationalist, with reports of a ban on Israeli books in our libraries nothing more than a fabrication by mischievous sections of the media. Actually, the whisky counter-boycott specifically mentions the unanimous decision of the WDC, and my letter of protest iniating the boycott clearly relates to their malicous claims of the "Israeli state's unacceptable use of force in the Occupied Territories." I guess knowing how to read isn't a qualification for the West Dunbartonshire Council's spokesman. "These articles have incited complaints, many of them unsavoury, from people who don't know the facts. Yes, we are complaining that the WDC initiated a one-sided, immoral boycott against the only democracy in the Middle East, without any mention whatsoever of the brutal Palestinian terrorism against Israel's civilian population. Once again, its the WDC that doesn't know that facts...and is in fact, rather clueless. "The latest of these is the threat of a counter-boycott. We appreciate the concerns of local business and recognise their importance to the economy of West Dunbartonshire. We have asked to be kept informed of any impact on sales in the coming weeks and months to determine the credibility of these threats." He added: "The council unreservedly stands behind its decision on the boycott and the fact Stirling Council has taken the same stance, and councillors in Dundee are keen to follow suit clearly shows we do not stand alone on this issue." I guess the Dundee Council voting against the resolution 24-2 shows the WDC does indeed, stand alone on the issue. Please don't confuse the WDC with the facts...it could upset their anti-Semitism. Keep on writing the Distillers of West Dunbartonshire! Keep the counter-boycott going strong! As if you needed any more proof that the Scotch Whisky Counter-Boycott against the West Dunbartonshire Council is working -- yesterday the Dundee Council in Scotland voted overwhelmingly (24 - 2) AGAINST condemning Israel, and they rejected a similar boycott of Israel. Our global counter-boycott of the West Dunbartonshire Council is now a proven deterrence against Scottish Councils boycotting Israel. For some odd reason, Scottish councils have the need to blather on and on about the Middle East and offering their "expert" opinion on how it should run. Aren't they responsible simply for running the local municipality and making sure the garbage gets collected? It should be noted that there has never been a ban on buying or lending books by Israeli authors in libraries in Dundee. 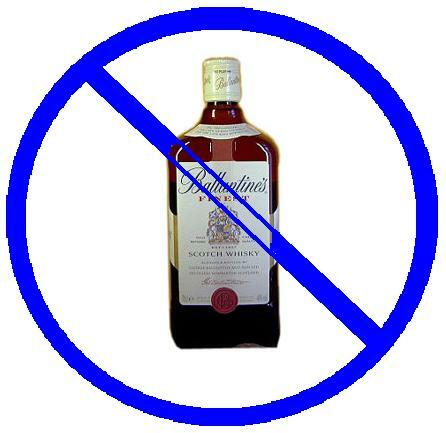 Keep the counter-boycott pressure on the Whisky Distillers and Bottlers...and the West Dunbartonshire Council will drop their boycott as well. Read all about the Updated Counter Boycott, here. I don't know how its been in the rest of the country, but in Judea (and Jerusalem) the weather has been outright weird the past few days. There are dark storm clouds in the morning, but no rain. It's windy, but feels like there's no air half the time. And it's windy cold, except when it gets stifling hot, only to alternate again. It's the middle of June and I'm going out with a fleece jacket in the morning, but taking it off every now and then so I don't overheat when it suddenly gets hot. Uzi Landau (Minister for National Infrastructure) has given the order to develop the Noa offshore gas field. This field's development was held up as it was feared that part of the field straddles or overlaps the offshore territories that we gave away to the Arabs in Gaza (are they part of the PA, or are they not?). Noble Energy studied the fields and determined in the end that the field doesn't spill over. The field will be tapped for short term/immediate emergency use as Egyptian supplied gas has become unreliable. There is an estimated 1.2 Billion cubic meters of gas in this field. As you know, Friday has become the day when Arabs and Leftists violently protest against Israel and the Jewish People. Today is no different, except that today the violence also spread to the Kotel and the Temple Mount, when police were forced to storm the Temple Mount after Arabs started massively stoning Jewish worshipers who were praying at the "occupied" Kotel below. I'm waiting for the condemnation of this attack. I really think it's time we start taking the prayers back to where it belongs, on Har Habayit itself. Labels: Friday protest. kotel. temple mount. arabs. stoning. 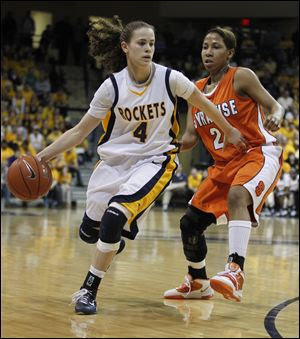 Naama Shafir is the first Orthodox girl/woman/female (yeah, you know who I did that for) to win an NCAA (basketball) scholarship. That is one of two things that make her unusual. The second is that she is careful about Tzniut (modesty) and wears a t-shirt under her uniform. This has never been a problem in Ohio or Israel where she is apparently considered a star player. But that's not good in Poland where Naama's team is due to play. European rules require that all team players dress exactly alike, and as such, Naama was disqualified from playing. First of all, Naama: Great Kiddush Hashem on your part. Second, who the hell wants to go to Poland anyway. They're still just a bunch of anti-Semites there. Remember the Mavi Marmara? 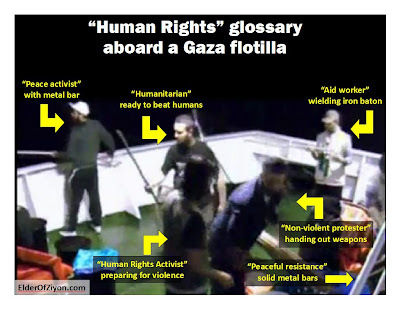 That "peaceful", "unarmed" flotilla ship of peace activists on its way to Gaza. Well, Yediot (Hebrew) has released photos of armed men peace activists openly walking around the ship with automatic weapons (the same ship Arab MK Zuabi was on, all the while claiming she saw no weapons). As for the IDF, these pictures aren't from them. They have their own set of photos which they haven't released yet - for reasons that are beyond me. I'd like to say, better late than never, but that doesn't even apply yet. For those in Israel, "air raid siren" testing is part of our routine, and every few months there are siren tests to ensure everyone will be able to hear them in case of an emergency. The IDF Homefront Command tested a new, additional system today; in the event of a critical emergency, urgent messages can be sent to entire geographic locations in Israel, by the IDF. 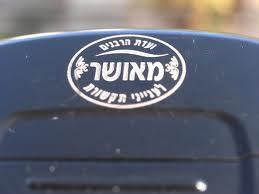 Of course, this presented a problem for the Chareidi population that only uses "Kosher" cellphones, which in addition to zero internet connectivity, these phones also blocks all SMS reception and sending. Therefore, in conjunction with the "Board of Rabbis for Communications", the IDF is creating a "workaround" which allows for SMS messages to be sent even to those "Kosher" cellphones, which under normal circumstances do not receive any SMS messages. In an interview with Kol Chai Radio today, Lt. Col. Gil Hoffman, head of "Computer, Networking, and Emergency Alert" division of the IDF's Homefront Command, said that about three hundred thousand "kosher" devices will be connected to the emergency broadcast service. "We're currently in an initial phase of the project. Only we [the IDF] are allowed to send these messages and security posts. It not only alerts for missiles, but also warnings against dangerous events, hazardous materials, fires, or urgent warnings from the Ministry of Health, for example, if residents Bene Brak would need boil their water prior to drinking it." I have to hand it to Likud Minister of Education Gidon Saar. He promised and he delivered. One of Gidon’s goals during his term as Minister of Education is to return to the education system parts of it that were uprooted by former holders of this important position. Specifically those parts related to basic Judaism. In February he announced that he was introducing 1-day trips for high school students to Hebron and Ma’arat Hamachpela (Tomb of the Patriarchs). The Left went bonkers. 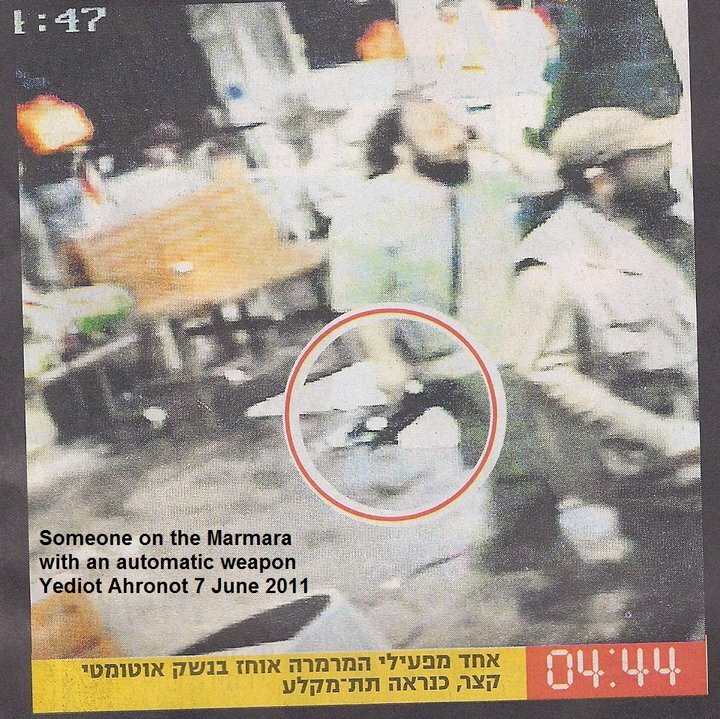 Every explanation was given as to why this idea should be killed before it got off the ground, “the Occupation”, security, brainwashing (no kidding, the head of Meretz said that), you name it. The idea that Jewish children would visit the city and tomb of our ancestors, what was once King David’s royal city, frightens the bejeebers out of the Left – after all, what might the students learn there? Jewish history? Attempts were made to block this program. Attempts were made to limit it to State-Religious schools. Attempts were apparently made to frighten the parents with scare stories. But Gidon was determined that all the students of Israel learn the basics of their heritage, not just the religious ones. This past week, the pilot program kicked off with students of a state (not religious) school from Beit Shemesh. Participation was optional, and despite that, there was over 95% attendance from 11th and 12th graders (and not a few parents too who tagged along). The students visited the Ma’arah and read some psukim from the Torah related to Avraham’s purchase of the cave. 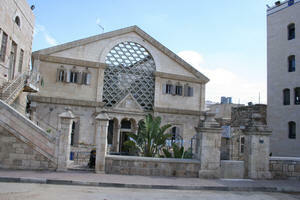 Afterwards they visited Beit Hadassah (read the link). Jews are only permitted in around 7% of the city. The other 93% is Judenrein, so there is a limit to how many places Jews can visit in Hebron, though we do have access to most of the important grave-sites of our ancestors. Meanwhile, the students’ responses were amazing. And the discussions were open. Students asked about the Arab-Jewish relationships and other relevant issues of the day. Ignorance was not part of this curriculum. In short, while Meretz wanted to keep Jewish children ignorant of their history and their ties to their country, Gidon Saar opened their eyes to what Meretz and the Left are desperate to hide. Labels: Gidon Saar. Likud. Meretz. Hevron. Hebron. School trip. Tomb of the Patriarchs. Ma'arat Hamachpelah. Beit Hadassah. I don’t know if it is a Jewish Urban Legend or not, but the story goes that someone asked the Lubavitcher Rebbi if the Holocaust could happen in America, and the Rebbe answered, “Overnight”. The Rebbe may have been wrong. It may take until November. What’s been going on, on US campuses is scary. There’s no question about it. And there’s no doubt there is a strong underlying stream of Anti-Semitism driving it (not just anti-Zionism as some claim). But I think what is happening in San Francisco beats the university problem hands down. 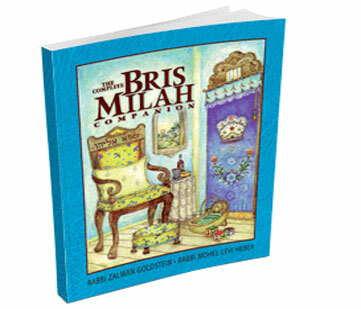 What is happening there with the anti-Brit Mila movement can be described as nothing less than an attack on, not just Judaism, but the most basic American concept of separation of Church and State, and Freedom of Worship – and that is something that has kept the Jews of America safe. This bill is an undisguised attempt to use American law to outlaw one of the most important of Jewish laws and rituals, and eventually spread that restriction throughout America. Furthermore, it is being done with the use of the most grotesque of anti-Semitic imagery that would do the Nazis proud. You could try to write it off as just another example of San Francisco fruitcakes in action, but it much more than that. This is a serious attack on Jews in California, Jews in America’s 13th largest city and Jews of America in general. Unless it is overwhelmingly voted down and condemned by most, whether or not this bill passes, it will be a serious blow to Jews of America. In fact, it is already a serious blow, I just don’t know if Jews in America realize how serious it is. The attack is un-American, and if this attitude spreads, that is what will make it dangerous for the Jews of America - until now the attacks were on "Israeli" symbols, now they don't even bother to hide that it really is against Jews. Labels: Brit Mila. bris mila. circumcision. san francisco. freedom of religion. seperation of church and state. foreskin. mgm. 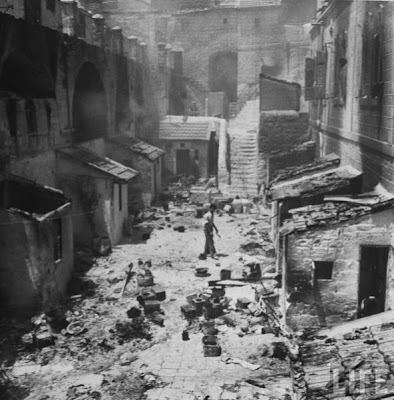 Everyone talks about the Nakba, but no one ever stops to think about what the Jews of Jerusalem went through when 5 Arab states and the local Arabs attacked the fledgling Jewish state to destroy it. Jerusalem was divided. Jews were kicked out of their homes with nothing more than what they could carry on their backs. 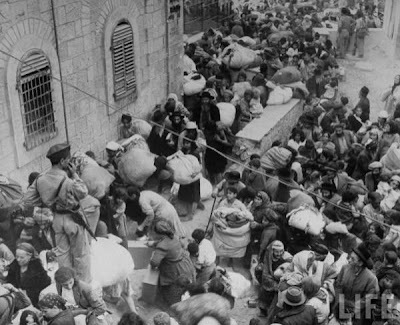 The Jews of Jerusalem became refugees. 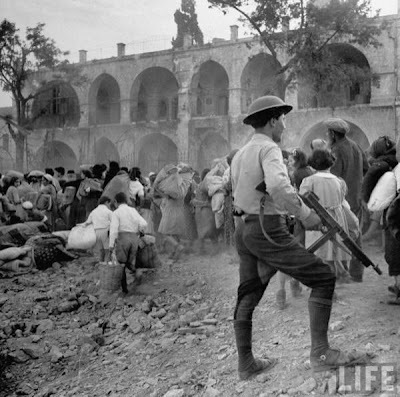 Jerusalem Girl Fleeing from the Arab onslaught. Jerusalem Jews evacuating their homes in 1948 - not to be able to return until 1967. Not everyone could escape the Arabs in time and were forced to surrender. 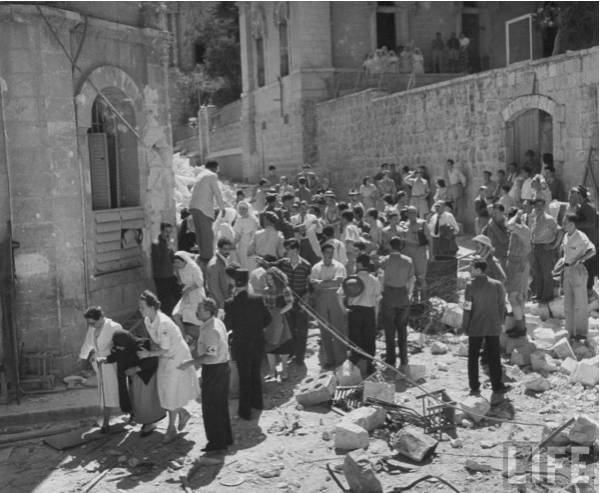 The Red Cross helping Jewish refugees forced to flee from the Arab occupation of Jerusalem. 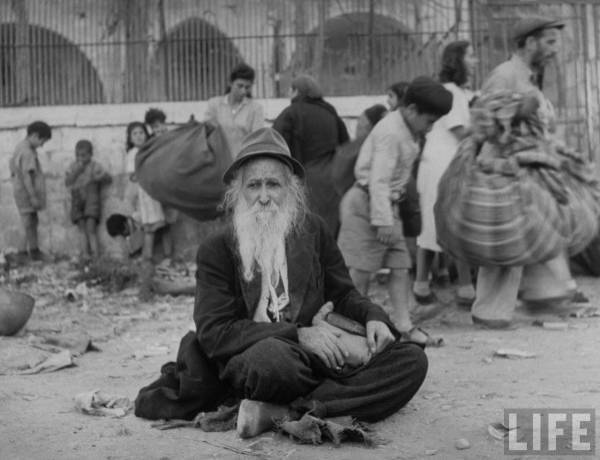 A Jewish refugee from the Old City after the Arabs occupied it. 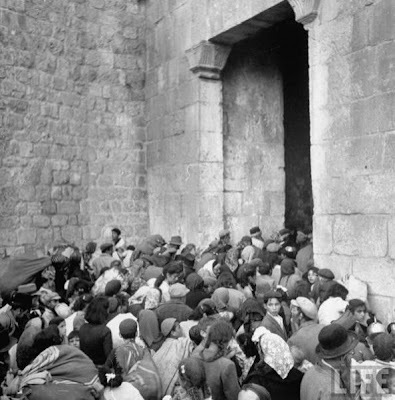 Jews fleeing their home through Zion Gate. 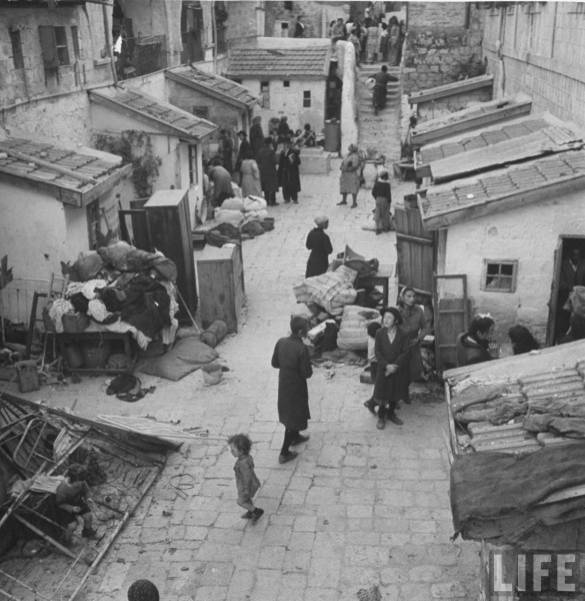 Photo of Jews waiting to be evacuated from their homes in the Old City. What the Arabs did to the Jewish homes and neighborhood after the Jews were evacuated.